One of the most frequently asked questions about the jade egg practice is why jade and not some other stone? Pure jade stone is known as a very balancing stone with a high vibration. Jade eggs are smooth, non-porous, semi-precious gemstones or crystals, dark-green in color. "Yoni Eggs" are really popular these days because they are so pretty, but I only recommend the ones made of nephrite jade because of hygiene and safety reasons. Pure jade also has amazing properties to enrich your practice and results. 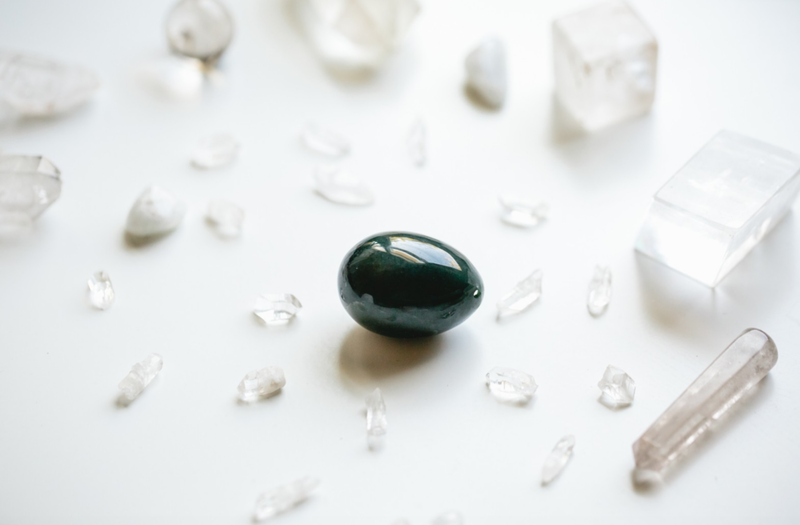 You may be tempted to buy yoni eggs made of rose quartz, or obsidian or other natural stones. (I was! I first bought a rose quartz yoni egg before I learned all I know now). Rose quartz is more porous than jade. If it cracks, bacteria can get it making it unhygienic. Also, rose quartz is known as an amplifier stone. Meaning that it intensifies whatever energy it is placed next to it. If there is any stuck or heavy energy in your pelvis (from sexual trauma, stress or religious/cultural conditioning that caused shame)- you definitely don't want to amplify that, right? Obsidian is a volcanic stone and is know to be extremely yang (masculine) and my teachers have said it is not a suitable stone for healing this part of our body which holds the essence of our feminine energy. Invest in a high-quality egg made out of pure jade stone which balances your energy. Be aware that not everything advertised as jade is real jade stone. Here are the best resources I have found where you can buy a high-quality nephrite jade egg. When you are first starting out, its best is to get a drilled egg, size medium, which is roughly 3x4 cm. Practicing good hygiene with the Jade Egg is super easy! There are just 4 things to keep in mind. 1. Properly sanitize your egg before first use. You can sanitize your egg by boiling it for 10 min. It only needs to be a gentle boil. Stay close to the water so you can turn it down if it starts to boil too rapidly. 2. Always change the string after each use. In the beginning you will use sanitized string with your Jade Egg for easy removal. That’s why there is a hole drilled at the smaller end of your Jade Egg. It’s for you to be able to string the egg before your practice. Use unwaxed, unflavored dental floss or medical grade string. Dispose after each use. 3. Immediately rinse the egg after each practice. After you’ve completed your practice and you have removed the egg, immediately rinse it, paying special attention to the hole so you can be sure to rinse out any vaginal fluids. Use vaginal-friendly, gentle soap. If you don’t wash the egg afterwards, you will want to reboil the egg before your next practice to make sure any hardened vaginal fluids that got stuck inside the hole break down and wash out. 4. Prepare the egg for your next practice. Note: This is an extra step of hygiene. My coach said she practiced with the Jade Egg in the jungles of Thailand for 10 years and did little more than wash the egg with warm water after each use. Some women are interested in wearing the egg around as they go about their day. This is a great practice and is awesome if you are able to keep the egg inside (and if you can’t yet, you’ll get there!). I’ve noticed that wearing the egg makes doing common chores and answering emails a little more sparkly. ;) Wearing the egg inside for longer than 4-6 hours is not recommended when you are new to the Jade Egg and this is to prevent unwanted tension on the ligaments in the pelvic floor. This is also why technically sleeping with the egg inside is not encouraged when first starting out. But some women LOVE to sleep with the egg inside and renowned Jade Egg teachers like Minke deVos (Author of Tao Tantric Arts for Women) swear by it and so it’s a woman’s personal preference. As always, listen to your body. Jade Egg practices cultivate energy and bring energy up and into the body. During heavy flow days your body really wants to release energy and so a jade egg practice during this time counteracts your body’s natural tendency to flow “down and out.” On light days, it's up to you - if your body is asking for it, then give it a go and see how you feel! It can get crowded in there, and you don’t want the stone jamming your cervix.